From flight attendants to doctors to CEOs and everywhere in-between, Manna Project's alumni network is comprised of over 2,000 exceptional individuals who continue to leave their mark on the world. We look forward to highlighting the accomplishments and achievements of our amazing volunteers and diving a little deeper into how Manna Project has impacted their journey. What was your favorite part about being a Program Director with MPI? What was your favorite program/what program were you most passionate about as a PD? Girl's Health for sure. I loved all the programs and the connections they gave me to the community, but girl's health was the most applicable to what I'm interested in and what I'm doing now. Having the experience of getting to work with such amazing girls, and really seeing firsthand what the education consisted of regarding health - in its broadest terms - in Nicaragua was so eye-opening. It was a major motivator in how I've chosen to structure the degree I'm working toward now. Please tell me a little bit about what you are currently doing! I currently live right outside Washington DC and work at the United States Institute of Peace, which is a federally funded non-profit that works in international conflict management and peace-building. I also go to grad school part-time at George Washington University's Elliott School of International Affairs, where I'm getting a master's focused on Global Gender Policy. How did MPI help shape the path that you are currently on? Manna was an integral part of getting me to where I am now. Without the experience I got abroad, I can't imagine getting the job I have now or getting into grad school. It taught me so much about putting what I had studied in undergrad into practice, and gave me real life experience. I talk about it all the time in interviews, as "fun facts" when you have to do those lame introduce yourself games, and just in every day conversation. Anyone looking to get into this field will benefit immensely from an experience like Manna. It's hard to quantify just how much. But I'm so glad I had it to get me where I am now! What is your funniest/best memory from your time with MPI? I can't even imagine trying to narrow one down. Every single weekend we would travel I would say, “wow, this is literally the best weekend of my life." And everyone would be like, "Liz, you said that last weekend." And every day something hilarious happened. Anything else that you would like to share about yourself! Any blogs, websites,etc. that you would like people to visit! If anyone is interested in learning more about where I work or go to school, I'm so happy to share! I know it can be hard to know what to do after Manna for some people, so I'm always happy to be around for PDs to ask questions to if they have any interest, especially in the DC/international relations arena! Simply put - the Manna family is strong. The friendships and relationships we built with our group of PDs, host families and community members will last a lifetime. I was particularly passionate about the partnership our team developed with the military officers from the United Nations Peacekeeping School of Ecuador (UEMPE). I currently live in Washington, DC and work as a Senior Advisor to Senator Amy Klobuchar of Minnesota. As a Program Director in Ecuador, I developed confidence in ways that have helped me continue to grow personally and professionally. In Ecuador we were consistently adapting to challenges in order to find success. We were presented with multiple opportunities to step up and gain experience leading program, group or class. We learned firsthand the power and impact of building strong community alliances. Too many stories! At one of my home stays, my host mother's car tire went flat in the driveway. She proceeded to have me change the tire just before I had to catch the bus for English class! Thankfully I made it on time, but ended up teaching class covered in grease and sweat. June 2018 Feature- Virginia Green, joined MPI in 2013 as a Program director for 1 year, then 8 months as the MPi recruitment coordinator, then 4 months as mpi country director, ecuador. What was your favorite part about being a Program Director with Manna Project? There was so much I loved about being a PD that it´s hard to name just one. I loved getting to spend so much time in the community. It allowed me to develop meaningful relationships with people in the community which is what helped me to acclimate to the culture so well. There was also a lot that I loved about living with the other PDs. One of the highlights was cooking dinner for each other every night. We all got really into it and would always put a lot of thought and effort into what we made. It was a great way to not only show consideration for our fellow PDs, but also a way to soothe some of the homesickness we would experience at times. What was your favorite program / what program were you most passionate about as a PD? As conflicted as I felt at times about teaching English in a foreign country, I have to say that I really enjoyed that program. I taught Adult English level 2. My students were always engaged and many went on to speak fluent English. Most wanted to learn because they felt it would help them in their careers and it often did. I had to set aside all of my idealistic rejection of the colonialistic implications and accept the fact that ESL, at least in Ecuador, was a legitimate and valuable endeavor for most of the members of our community. I also loved our adult cooking class. It sort of evolved into a cultural exchange class over time, but we had consistent participation from students and it was always fun to share recipes. Currently I work full time as the Bilingual Case Manager and Victim Advocate at My Sister's House, Inc., a domestic violence organization in Charleston, SC. I assist women who are seeking restraining orders through Family Court. I also do case management with clients who are in shelters due to fleeing their abusive partners. And of course, I work with all of our Spanish speaking clients as well. Additionally, I have almost completed my certification for healthcare interpreting. I work on contract for agencies in need of a Spanish interpreter, and I also volunteer at a free clinic every week as a Spanish interpreter for LEP patients. I'm also leading a unification effort for all social service, healthcare and law enforcement agencies in my area that work with immigrant victims of crime in order to address some of the barriers that both the agencies and the victims have encountered in providing or accessing services. How did Manna help shape the path that you are currently on? Honestly, Manna really did shape so much of what I've done since then. Not only did I learn fluent Spanish, which has guided a lot of my career, it also refined my interest in social services. I learned the important role that small organizations can play in the bigger picture of community development. I also think that learning to adapt myself fully over a long period of time to a completely new culture and language, the essence of true immersion, taught me patience and understanding when working with diverse populations. Thanks Manna! What is your funniest/best memory from your time with Manna? Again, so many things come to mind. Sharing a room (which we dubbed La Cueva) with Abby and Taylor is one of my most cherished memories from living in the Manna house. But, even saying that is difficult because I have so many cherished/best/hilarious memories. It is so hard to pick out my favorite part about being a Program Director with Manna. Every part of the experience was so meaningful to me. Of course, I loved living in Ecuador and miss it every day; I am so thankful to have had an immersive experience in such a beautiful country. I traveled everywhere and got to have so many bucket list-worthy experiences! I also loved getting to know the members of the communities that we worked with, who went out of their way to be welcome and loving as I adjusted to life in Ecuador. I am so thankful for having met so many incredible people who made my time in Ecuador so meaningful. My favorite program as a PD was the library. I enjoyed spending time with our regulars and having the opportunity to see and interact with members of the community on a daily basis. I especially enjoyed interacting with all the kids that were always waiting to enter at the exact time we opened! My second year in Ecuador I got to work on partnerships with several different local schools as well, and I met so many amazing students that were so passionate about learning. Another favorite program was our Adult Nutrition and Cooking classes that we had on Saturdays. It was such a great way to interact with the community members. Every week we would choose a different recipe and cook together, which was a great way to teach our students recipes from the U.S. and have them teach us about recipes from Ecuador. I still cook a lot of those recipes today! I’m currently getting my Master in Public Administration with a concentration in international development at Cornell University. I also teach English as a Second Language and am interning remotely for a small nonprofit in Guatemala called Women’s Justice Initiative. It certainly keeps me busy, but I am learning so much in the classroom and in practice that is helping me grow professionally. This summer I will be working full time as an Economic Development Fellow for Cornell’s Center for Regional Economic Advancement, and when I graduate in a year I hope to work in program management for an international development project. Manna was definitely integral in helping me discover the path I am on today. I started with Manna just after graduating from college. I had studied Spanish and Latin American Studies and knew I wanted to spend some time working abroad at a nonprofit, but I didn’t know much more than that. The PD position was a fantastic way for me to learn more about the challenges and rewards of international development and nonprofit work. Because Manna lets program directors get so involved in so many different areas of nonprofit management, I was truly able to try out everything and learn so much about so many different aspects of nonprofit management. I managed social media channels, worked on metrics and evaluation systems, organized fundraisers, managed countless volunteers, and more! This was invaluable to me in helping determine what I was interested in pursuing after leaving Manna, and has been indispensable to me in my subsequent work. One of my favorite memories from my time with Manna isn’t a specific moment, but generally just spending time with the program directors in the Manna house. I was so happy to have such a fantastic group of like-minded individuals that were passionate about the community and passionate about making the most of their time in Ecuador. It was such a fantastic experience living and working with such a great group of people for a whole year. I got married in October and we had our first big reunion of all the PD’s from my first year with Manna. It was such an amazing feeling being back with such a great group of people that became like family, and celebrating with them all together. What was your favorite part about being a PD with Manna Project? The community relationships. 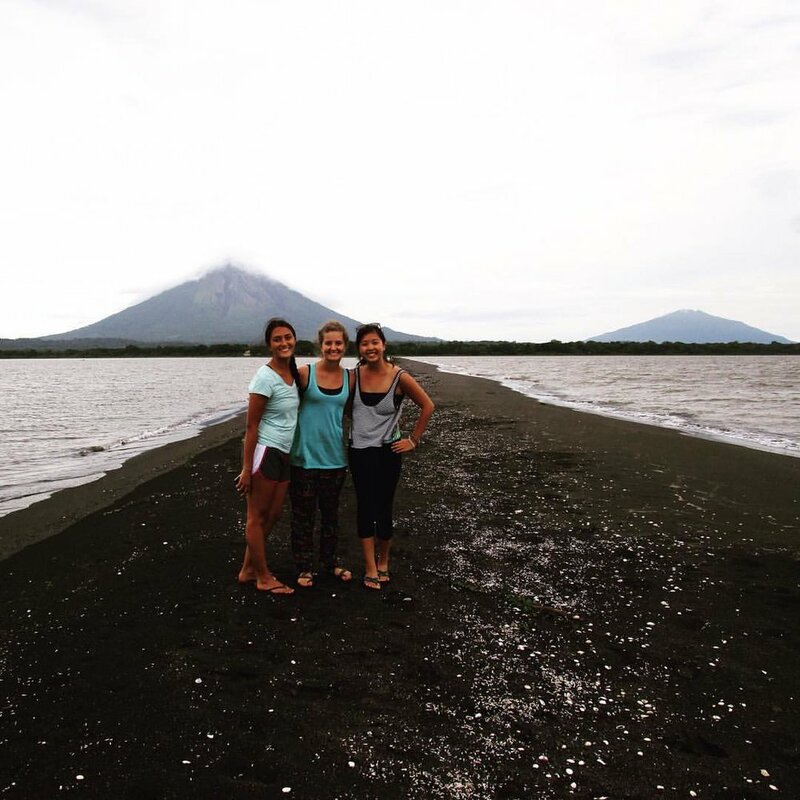 Arriving to the Nicaragua site, I was nervous about how I would be received in the community with my limited Spanish knowledge and the fact that I was a new face. However, the first night I was in the country, we had dinner at a community member’s house and that anxiety immediately went away. During my five months, I made it my mission to spend as much time in the community as possible. My favorite part of this was my home-stay. I stayed with the family of one of the boys I had become close with in Camp JAM and his siblings who were in my English class. Those five days that I stayed with them in the community completely fortified a bond that I have carried with me to this day, 2.5 years later. After the home stay, I would visit them almost every day, whether to eat meals, watch telenovelas, or sit and enjoy each other’s company. This family, along with every other community member that I interacted with, holds a very special place in my heart and I am grateful for how much they positively impacted my experience with Manna. My favorite program was English 3. Not only did I have a great co-teacher in Kayla, but I really felt like we were able to make improvements in our students’ capabilities of reading, writing, and speaking in English. In addition, our class was full of some of the most dedicated students, with some of them showing up early to class or coming to Friday afternoon tutoring sessions to further their knowledge and practice. Through this, I found my best friends in the community: two brothers, around my age who took me in as another brother. They helped me practice my Spanish just as much as I helped them with their English. Additionally, as part of this class, all of our students’ hard work culminated in a trip to the beach together. This was one of the best days of my five months in Nicaragua. It was a great day to just hang out and spend time with one another without having to stress about the past participle tense or transportation vocabulary. Please tell us a little bit about what you are currently doing! 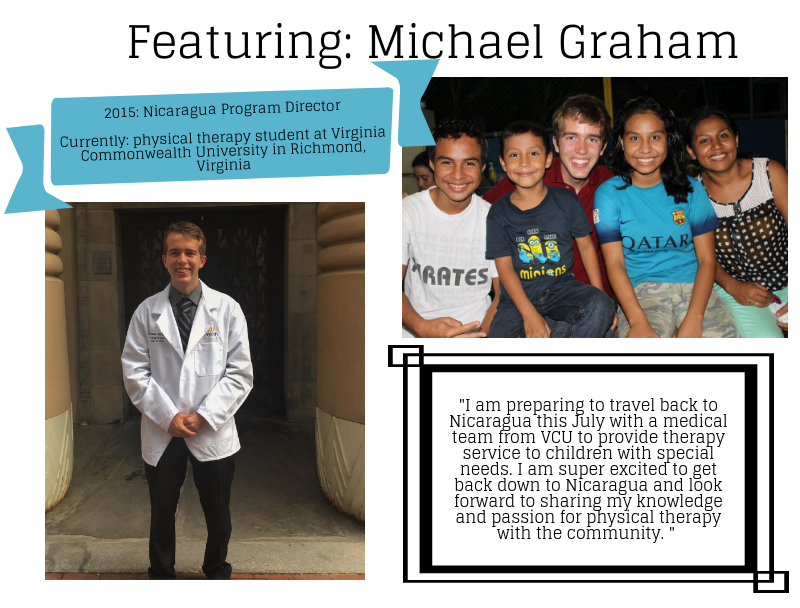 I am currently a second year physical therapy student at Virginia Commonwealth University in Richmond, Virginia (my hometown). I am finishing up my last semester of class, and then will have full time clinical rotations until next spring when I graduate in May 2019. Additionally, I am preparing to travel back to Nicaragua this July with a medical team from VCU to provide therapy service to children with special needs. I am super excited to get back down to Nicaragua and look forward to sharing my knowledge and passion for physical therapy with the community. Coming into working with Manna, I had already applied to physical therapy school. However, after my five months, I realized how passionate I am about international service and how I have the goal of continuing this service as a licensed physical therapist. I had traveled to Nicaragua three times prior to my time with Manna, so those five months really solidified by love for the country, the culture and the people. Now, I am always thinking about Nicaragua and how I can get back down there as soon as possible! I celebrated my 23rd birthday while I was in Nicaragua, and I thought that it was just going to be like any other day. That was not the case, though, as my English class turned our Friday tutoring session into a surprise birthday party. They had all coordinated the party and brought drinks, food and cake to help celebrate together. I felt so honored that they held this party for me, and realized how grateful I was for the relationships I had formed with each one of my students. What was your favorite part about volunteering with Manna Project? My favorite part of being a Program Director with Manna was the opportunity to explore many different program areas and work on a variety of projects in a global setting. I learned a great deal about programming and evaluation has been useful in my current work. My other favorite part was working with my 9 best friends every single day and seeing my favorite kids at the Library. What program were you most passionate about as a Program Director? My favorite program was my Level 2 Adult English classes, which I taught each semester. This was where I really discovered my love for teaching and it was a great opportunity to meet community members- many of whom I'm still in touch with! It was so rewarding to be able to share a skill like English with people who are so hungry to learn. I am currently working as a Public Health Associate with the Centers for Disease Control and Prevention (CDC). This is a two year fellowship through CDC that has placed me at Boulder County Public Health in Boulder, Colorado (so I'm back in the mountains!). In Boulder, I'm part of the Healthy Eating, Active Living and Built Environment team. I focus on policy and systems changes that ensure everyone has access to what they need to be healthy, specifically healthy food and beverages. Our goal is to make the healthy choice the easy choice for all Boulder County residents. Some examples of work we do is expanding nutrition incentive programs to farmers markets to increase access to fresh produce, campaigns to promote healthy beverages like water and unflavored milk on children's meals, and ensuring that our mobile home park residents, many of whom are Latino/Hispanic or monolingual Spanish speakers, have access to palatable and safe drinking water. My year in Ecuador with Manna definitely solidified my passion for public health, Latino communities and the importance of supporting communities with the tools they need to be healthy and successful. After my time with Manna, I transitioned into sexual and reproductive health work back home in North Carolina as a HIV/STD Latino Health Educator- a role I know I wouldn’t have gotten without my experience with Manna. I absolutely loved teaching classes again and using my Spanish skills. I still work to eliminate health disparities in my current role, even though I am a bit more removed from direct service. We work through Promotoras, Latina lay health advisors, which has been the most effective way to reach our Latino/Hispanic populations. It's hard to choose my favorite memory but I loved all the trips I took with other PDs. One of the best was our trip to Guaranda for Carnaval. Guaranda is one of the premier Carnaval destinations and it truly did not disappoint as we were met with parades, flour and water balloons. We ended our trip on the coast with some much needed beach time. Almost all our travel plans fell through, which was common for most of our trips, but that makes for even more special memories! Is there anything else that you would like to share with the Manna Family? As mentioned earlier, I'm extremely passionate about giving people the tools they need to be healthy. In Boulder, our Latino/Hispanic communities face the greatest health disparities. If you're interested, please take a look at these phenomenal videos in the series Justicia Refrescante that highlight several key issues Latino/Hispanic families face in Boulder. The "Agua" video represents the impetus for my team’s current work with drinking water in mobile home parks because no family should have to opt to serve their kids sugary drinks just because they don't have access to palatable and clean tap water. What was your favorite part about volunteering with Manna? My favorite part of being a Program Director was having the independence and empowerment to take on challenges and make long term decisions in our programming that made a meaningful and lasting impact on the community and organization. I don’t think there are many organizations where, in an entry level position, I would have been able to help shape the direction of many of the programs and continue to recognize and be invested in their impact even after leaving Nicaragua. What was your favorite program/what program were you most passionate about as a Program Director? I was very passionate about my work in the Villa Guadalupe Clinic (VG). Community members in VG often don’t have access to healthcare outside of the Manna Clinic. It was humbling to experience how valuable our doctor’s and health promotors were to the community, and how essential quality care is in one of the most underserved neighborhoods in Managua. I was also passionate about Lacrosse the Nations (LtN) while in Nicaragua. Being at practice for two years, I was privileged to see massive growth both from individual players, and form our team and program as a whole. I’m currently a first year medical student at the University of Virginia. Manna gave me an incredible opportunity to gain experience working directly with patients and be a part of their community, so I could see the impact and challenges of their healthcare. My experience with Manna also changed my outlook on the world and allowed me to mature and become a better person. Getting to watch Nicaragua's National Soccer team beat Haiti to go to the Gold Cup with all the LtN Coaches. Hearing one of the coaches say that one day they'd be playing there, in the national stadium, on a Nicaragua Lacrosse team was something special. I found my love for education as a PD with Manna. Teaching English levels 4 and 5 and also being one of the pioneers behind the English Vocational Training program was the most rewarding experience. I just went back to Nicaragua in February, and more than 5 of our English students currently work in call centers utilizing their English every day. It’s incredible to see how far they’ve come in such a short amount of time and being part of their journey is very special to me. The day-to-day work at Manna can be difficult but the outcomes and success stories that we see long term make it all worthwhile. Please tell me a little bit about what you are currently pursuing. I currently work on the Marketing Team for Teachers Pay Teachers (TpT) -- an online site where teachers can buy, share, and sell educator-created content for their classrooms. I get to work directly with teachers and find new ways to support them every day. Teachers have the most important job but they often go unrecognized, so I love the work I get to do as part of the Marketing team and sharing teachers’ stories. How did Manna Project help shape the path that you are currently on? Working as an educator in Farito and also in the public schools in Nicaragua has helped me understand the exhausting, yet incredible role of teachers. It also expanded my knowledge of the education space and international education. I learned first hand that school funds and resources for teachers are always limited and that’s something Teachers Pay Teachers works to support. Also working alongside Meghan Brennan, the former Director of Development and Communications taught me invaluable experience about creating powerful messages and stories and getting your audience to take an action. I learned so much from her and we still keep in touch to talk about work and life in general! My all time favorite memory was creating the Orientation Video welcoming new PDs to Nicaragua. Our video was inspired by MTV Cribs to showcase the friendships we have amongst PD’s and the ins and outs of the Manna house. We also highlighted the meaningful work and unmatched adventures you can have as a PD in Nicaragua. Creating this video was collaborative, silly and a fun way to recap the best year ever. I’m so grateful for technology and that we were able to capture so many memories with videos and photos because anytime I’m missing Nica, I always rewatch this video. If you are a Manna Project alumni and would like to share your story or nominate a fellow alumni to be featured, please email jackie@mannaproject.org.